Two nights before closest approach, on Dec. 30th and 31st, something extraordinary will happen: Comet 8P/Tuttle has a beautiful close encounter with spiral galaxy M33. The comet and the galaxy may even overlap! This is a can't-miss opportunity for astrophotographers around the world. 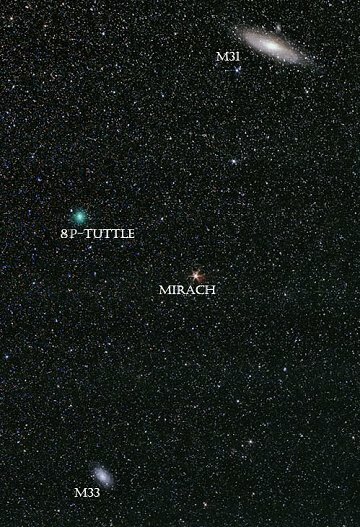 After a 13.6 year absence, Comet 8P/Tuttle is once again traveling through the inner solar system and on Jan. 1st and 2nd it makes its closest approach to Earth--only 24 million miles away. The emerald-colored comet will brighten to a predicted magnitude of 5.8, visible to the unaided eye from dark-sky sites and a fine target for backyard telescopes.sky map. On Dec. 29th in the mountains of northern Italy, Giampaolo Salvato took a picture of Comet 8P/Tuttle, see below, using no telescope at all. "This is a 5 minute exposure with my Canon 5D digital camera set at ISO 400," he says. Click on the image for an even wider view, which encompasses exploding Comet 17P/Holmes, variable star Algol, the Andromeda Galaxy (M31) and some lovely star clusters. Comet Tuttle is racing across this starry expanse for a Dec. 30th encounter with spiral galaxy M33--a can't-miss event for astrophotographers. Stay tuned to Skywatch-Media News for more photos!